It did not take long for the flashlight companies to discover that the flashlight was more than a toolbox item. 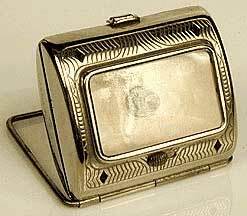 Starting about 1925 the country was introduced to the the Art Deco style. 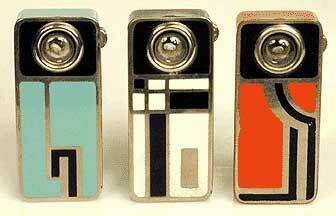 Everything that was mechanical was now being decorated in an Art Deco style. 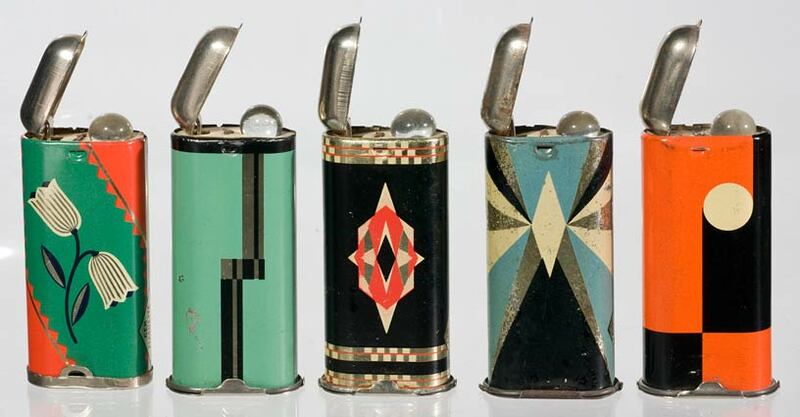 Chief among the flashlights were the lights made to go in a lady's purse or gentleman's pocket. Many have held up in surprisingly good condition due to their limited use. Allbright 2 "AA" size lights. Allbright made a few larger lights, but they seemed to specialize in the small or unusual. 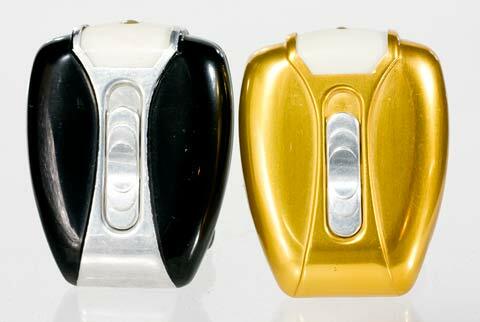 The light on the left is a 2 "AAA" cell anodized aluminum model made in France. The light on the right is unmarked but is probably made in the United States. 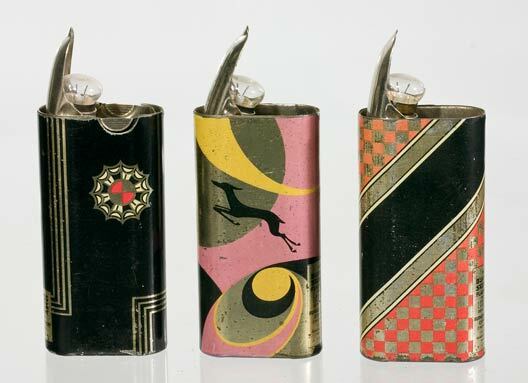 Both were probably made during the 1930s. 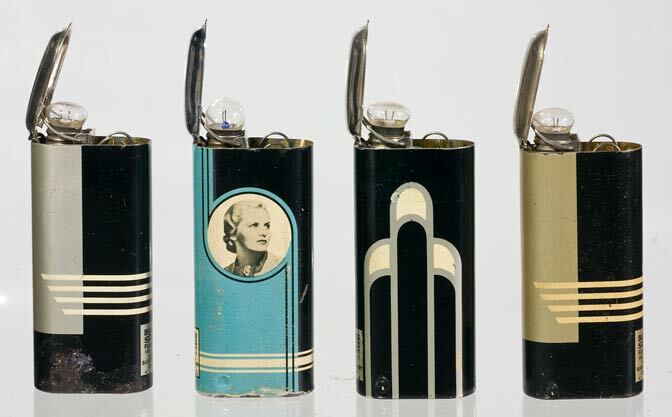 A great group of 1940 USALite pocket flashlights in Catalin plastic. They use 2 "AA" cells. 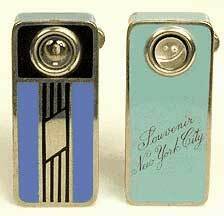 1937 Eveready Pocket Spot-Lite, model #215, was a superbly designed pocket light. It used 2 "AA" cells. These are the only two colors made. 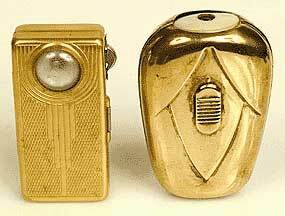 The Gem-Lite was made about 1933 through 1935 and used 2 "AA" cells. Considering that these are 65 plus years old, they have remained in fairly nice condition. Note that the bottom lip varies in shape. 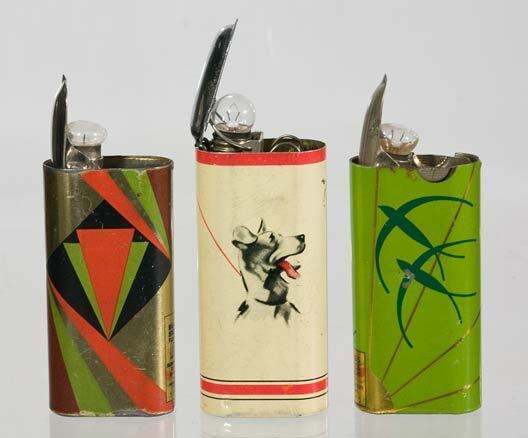 Gem-Lite most likely made these for other companies and changed them slightly to differentiate them from their own designs. 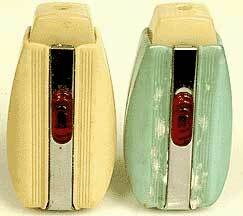 Gem-Lites originally came with a solid glass bulb. Burgess made Snaplites begining about 1928. Note that the bulb is mounted differently than Gem-Lites. The first model has a simple standard design (not shown). 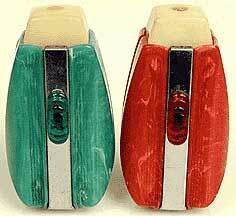 In 1929 they added the model 2 that offered a few variations in finish. Some resembled leather and could be imprinted with a company's name (again, not shown). 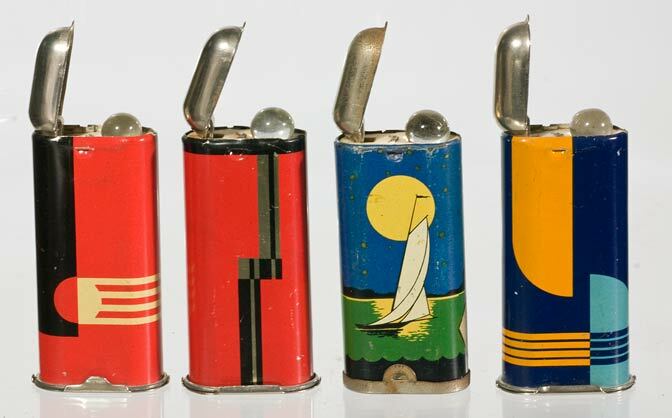 About 1930 they started making these superb Art Deco purse lights. The dog in the above left group resembles "Asta", the detective's dog in the "Thin Man" series of movies starring William Powell and Myrna Loy. More Snaplites and a very rare Snaplite - The 1929 "Light's Golden Jubilee, 1879-1929". This was made to honor the 50th anniversary of the electric light bulb, invented by Thomas Edison. This is the Chase Airalite made in 1932. It used 2 "AA" cells. Note the nice black enameling highlights on the nickle body. It originally cost one dollar and was advertised as being like jewelry. Chase was a large brass company, specializing in brass sheet and pipe. The owner's son wanted to enter the consumer goods business so he created the "Specialties" line (1930-1942). This dates their lights to this 12 year period. There are many varieties of Chase lights, but I think that this is the best looking one. 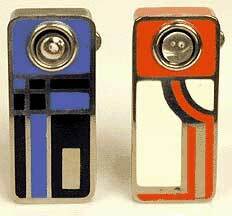 Don't you wonder why manufacturers aren't making more decorative lights for use as jewelry or personal accessories? Most look at lights as a way to sell batteries and consider their business as the battery business. Books #3 on Flashlights, Picture Frames & Halley's Comet| Ghosts In The Cemetery| Waffle Recipies| Links Copyright 2010 through 2019 by Stuart Schneider. Do not use any parts of these pages without written permission.